Recently we stumbled on a small grocery in central Kawagoe. In addition to locally-grown grains, they had also had a decent selection of organic products and even a couple vegetarian items! I had just “liked” them on Facebook (because I like them in real-life) when the flash of a logo caught my eye. The Kawagoe Farmers Market! Most local events are advertised to, well, locals, meaning everything is in Japanese. 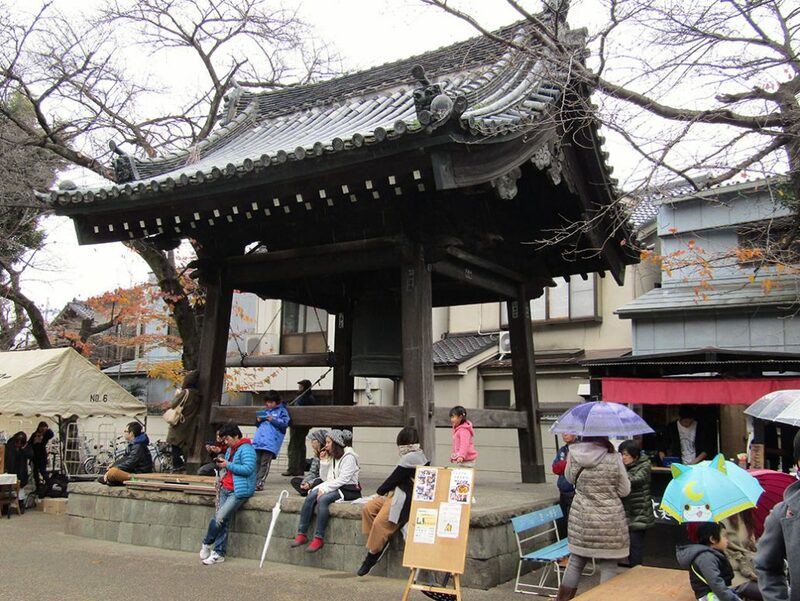 The farmers market site is no different, but with a bit of translation work, I figured out it’s held monthly at Renkeiji Temple in the heart of the old town area called Koedo. Back home, spending a Saturday wandering around local farmers markets was one of our favorite activities. We’ve found a couple really good ones in Tokyo, but making the hour-plus trip into the city can be daunting. We were excited to check out this local option. The market was bustling considering the cool and soon-to-be rainy weather. 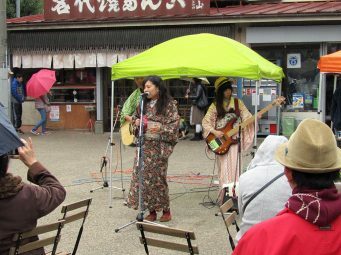 A local band performed at one end of the market; the music could be heard from a block away. 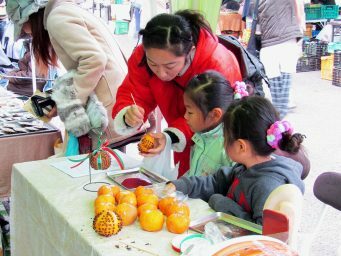 Kids and adults alike toiled away at the craft tables, making Christmas ornaments, pomander balls (clove-poked oranges) or decorating reusable market bags. Our heads swiveled back and forth, led by our noses, as market-goers walked by with lunches prepared from locally-grown ingredients. Soups, noodles, sweet potatoes, tea, coffee and sake. The unforecasted rain didn’t dampen anyone’s spirits. The Japanese are magically prepared for rain in a way I’ve never seen anywhere else. 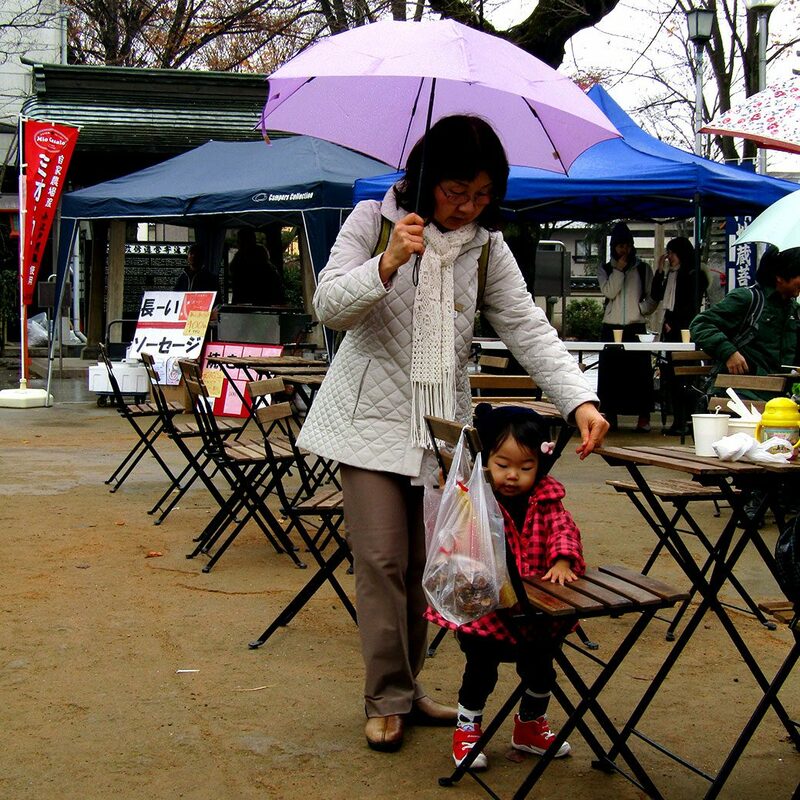 Adorable children popped open equally-adorable umbrellas that engulfed their tiny frames. 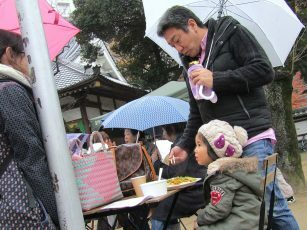 In the area with the food stalls, people ate with one hand while holding umbrellas over the table with the other. We ordered a unique take on ramen for lunch. 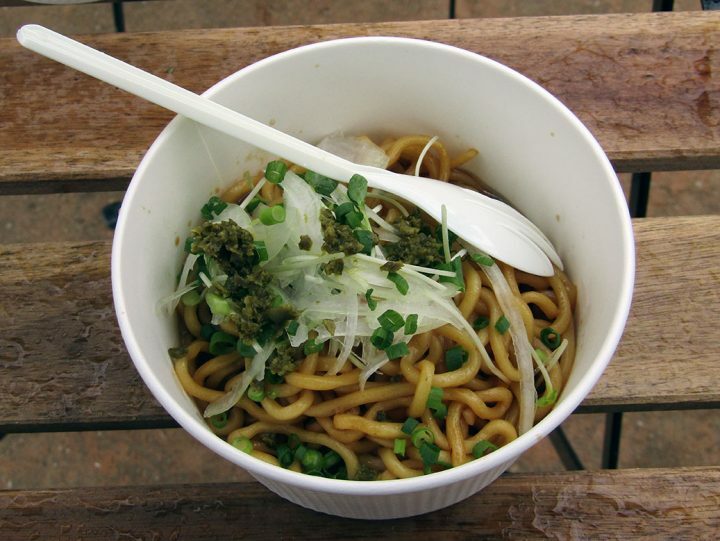 Thick noodles tossed in a homemade sauce and topped with thinly sliced raw onions and a special blended sauce made from wakame (seaweed) and capers. A friendly local who spoke near-native English explained the mysterious seasonal produce to us. In addition to a beautiful head of purple cabbage, we bought a bag of oyaimo—Japanese taro root— and some sweet yellow carrots. A local farm offered free-range eggs. We bought a bubble-wrapped bag of 20 to go. We rounded out our purchases with some really flavorful black rice crackers and an organic black rice beer. Waffles at the Fuku Fuku Stand near Renkeiji Temple. Cranberry syrup on the left and maple syrup on the right. As we exited the shrine, I noticed a waffle stand that we’d seen on television a couple months ago, but never managed to stumble upon. One last snack for the day! 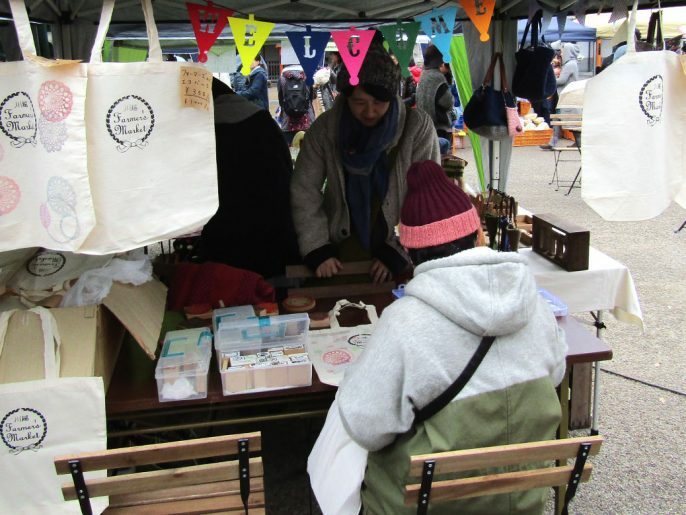 On Monday, my Facebook feed filled up with photos that vendors and visitors took at the market. Full bellies, full hearts and full smiles everywhere!